View of Manchester City Centre from UMIST main building. Near left, Shena Simon College; Upper left, Portland Tower. Smaller tower with gold glass windows: Bank of England; Large block centre: Sunley Building, with Piccadilly Hotel in front. Pointed clock tower: City Police Courts. Foreground buidlings centre and right belong to Manchester Metropolitan University. Independent MP Martin Bell was on the front cover of the Evening News on Friday - He was taking part in a demo in favour of a new road. 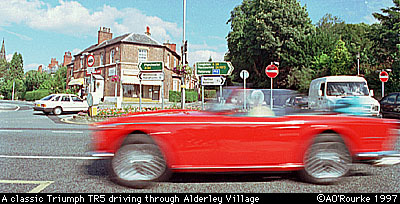 Residents in Alderley Edge, dubbed "millionaire's village" blocked the high street by repeatedly using a pedestrian crossing. A few weeks ago Socialist Worker activists sat down on Oxford Rd to protest against tuition fees. A large number of Alderley Edge residents are desperate for a by-pass to be built - since the new A34 Handforth and Wilmslow by-pass was completed last year, Alderley Edge has been one long traffic jam during the day. Residents in poorer parts of the north west will be benefiting from �,000,000 in government grants. Oldham will get �5m for its Welfare to Work scheme, � will go to Eastlink in Manchester and Tameside, and � will help improve the Brinnington Estate in Stockport. I remember as a schoolchild people had a certain notoriety if they lived "on Brinnie". Maybe with the money, one day it'll be as posh as Alderley Edge. Lottery funding was denied last week for the Imperial War Museum proposal on the banks of the ship canal at Trafford Park. Though increased private funding was secured, the proposal was still turned down. Just across the water in Salford Quays, the Lowry Centre, a striking new Arts and Cultural centre, is starting to take shape. And the Halle Orchestra has launched an appeal for one and a half million pounds. This year they nearly went bankrupt, and have since announced that they will be cutting some musicians and support staff. The music goes on, however, under the leadership of conductor Kent Nagano. British Midland have had an extensive billboard advertising campaign for their new Manchester to Heathrow service, and today it started up. This means BA no longer have a monopoly on the route, so hopefully fares will fall. Up till now passengers have had to pay well over two pounds for every minute spent in the air - it's usually not much more than half an hour from take-off to touchdown. Fiction and fact have merged in an extraordinary way over the past couple of days with the imprisoning of Deirdre Rasheed - not a real person, but a character in Coronation Street. During the trial yesterday, there was an audience of 16.3 million. During this evening's show, electricity demand doubled. A "Free Deirdre" campaign has been launched, and MP's and members of the public have written to the Prime Minister. A prison set has been constructed on the Granada lot, so it's unlikely that Granada bosses will allow her to be set free until they've got a good return on their investment. Tomorrow GMTV - the breakfast tv show - will be reporting live from her cell. Amazing isn't it? Meanwhile in the real world, a policeman was attacked in Chadderton Cemetery on Friday night. And in south Manchester, two policemen were confronted with a youth brandishing a gun. 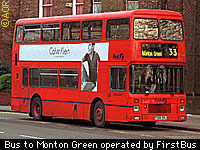 The incident happened on the notorious Alexandra Park estate. Subsequently, Malachi Reynolds (19) from Moss Side, was arrested charged with four firearm and robbery offences. He was accused of intent to endanger life, resisting arrest, and possessing a prohibited weapon. I hear that there may be a link between these offences and the incident last year in which two people were killed by a sports car on Upper Chorlton Road. The person who told me, an American resident in Manchester, said she likes living in Manchester as it has a relatively low crime rate, at least in comparison with her home town. This Saturday, a new police drama entitled "City Central" will start its run on BBC1. The BBC hope it will be a Z Cars for the nineties, and stars Paul Nicholls, the former Joe, son of Lorraine in EastEnders. The programme will feature lots of location shots taken in and around Manchester, so I'll be glued to the screen. And who did I see walking nonchalantly across St Peter's Square last week? Paul Nicholls himself. Yes, Manchester may not be quite "Hollywood of the North" but bumping into celebrities is not unusual here. The rock band James performed live in Castlefield on Wednesday afternoon. The event was featured widely on local radio particularly Key 103, which you can listen to now at www.key103fm.com. A new pub in Worsley won't now be called "the Parson's Nose" in deference to local people, who thought naming a pub after a chicken's posterior was too rude. It will instead be called the John Gilbert, after a local engineer. And here's a famous person connected the River Irwell, seen in this pub sign from the riverside pub, the Mark Addy, situated across from Bridge Street. The weather during most of last week was overcast, but mild. And then on Friday the skies cleared and off I went with my camera. By late afternoon, the sun had gone behind the clouds, though it made a return visit the next day. Yesterday was washed out, but today, there were blue skies and billowing clouds over Manchester - and now that the clocks have gone forward, the evenings are are suddenly brighter. I saw a brilliant presentation by a young Trafford Park-based company specialising in Virtual Reality. They have some interesting VR models of local buildings, including Salford Art Gallery. Find 3d Web Technologies at www.3dwebtech.co.uk, and be prepared to download some plug-in software. Your photos of Manchester are just great. The Jewish Hospital was on Elizabeth Street Cheetham. Herbert St was just about facing the Hospital. I lived there from 1935 to 1943 when I moved to Stretford. I have always had a soft spot for Manchester so thanks for all the photos. Location: Stockholm Sweden Connection with Manchester: Born in Manchester 1958. Lived in Swinton until 1984. Attended Moorside high school. Best feature: The news and the photos are excellent.What a great site for mancunians in exile! What could be improved? : Just keep on keepin on!! Requested photographs: The old Swinton town hall building (now called Salford Civic Centre). Lit up at night it used to be an impressive scene. There was also a story that the clock on the tower was one of the first in the world to be luminous on all 4 sides, also it was said that, there was an identical town hall somewhere else in the uk. Your photos are as interesting as ever. The recent view from Portland Tower adorns my desktop but I am so out of touch I dont know what any of the buildings are -- perhaps on a future city photo you could drop in some place-names. It's great to see these photos of Manchester, then and now. Do you have any of the Salford area? Is it possible for you to have a photo of the present Xaverian college on your weekly web page. I would really appreciate it.